The second most common method of escape is digging out — or digging in by a neighbor’s pet. “This is a tougher situation to handle because to prevent it you have to create an obstacle next to the fence, such as a concrete or block planter or bench, or put down a barrier below ground level, which could require some pretty serious trenching,” Stormi says. TWO RULES OF THUMB: Use fencing no one can see through or reach through, and don’t confine your dog to the yard for long periods of time. Photography ©artisteyephoto | Getty Images. To paraphrase an old saying, “An ounce of prevention is worth a pound of heartache.” One of the most reliable forms of restriction is a fence. “Galvanized chain-link fencing is the regular old standby fence to enclose a yard,” Stormi says. “It’s sturdy and durable. If it is tall enough, it will pretty much contain any dog.” Negatives are you can see through it, and a child might be able to put her hand through it and get bit. Stormi adds that other fence options include wood, vinyl and composite materials. A wood fence might be best for dogs who are chewers because other materials might damage their mouths. To increase a gate’s safety, Stormi recommends installing a self-closing and self-latching mechanism on all gates to your yard. She says the hardware is easy to find and install. You might want to install padlocks on the gates to prevent anyone from opening the gate when you aren’t around. 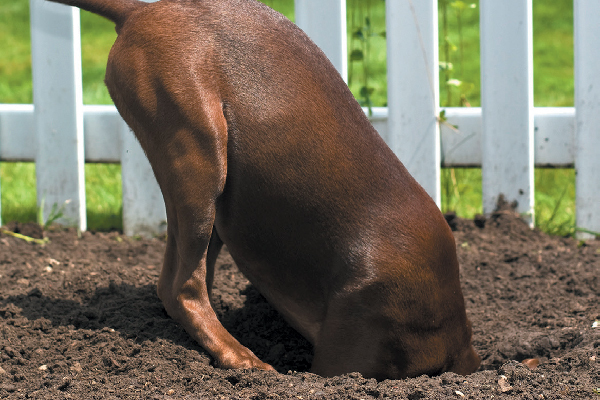 Something like a new neighbor might cause your dog to start digging under the fence. Photography ©merobson1 | Getty Images. Once you have a fence or other enclosure, your work isn’t done. “Performing a ‘perimeter patrol’ periodically will reveal any covert escape routes in progress,” Stormi says. “Pay particular attention if a new pet or family arrives next door.” These new neighbors might provide a new reason your dog starts to dig. “Secure your yard to make sure there are no small openings, such as cracks in fences or loose boards near ground level, for your dog to escape through,” Pam adds. A year-round prevention tip is to give your dog plenty of physical and mental stimulation, like toys and hidden treats. “A satisfied dog has no reason to want to leave the yard,” Pam says. How do you find a lost dog? Photography ©fergregory | Getty Images. Microchip your dog, and keep the information up to date. A microchip is an easy and permanent way to identify your dog. It also can legally prove the dog is yours. 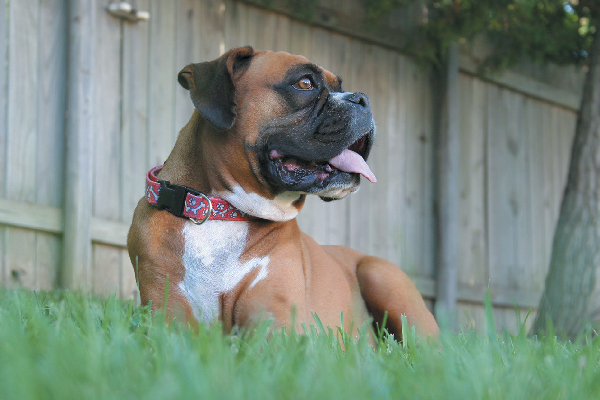 “Make sure your dog always wears a collar with an ID tag,” Pam says. Include a local friend’s contact info, along with your own. Teach the Recall cue. “A dog who has learned to come to the owner when called because rewards are forthcoming is less likely to want to leave the yard but, should that happen, the dog is easier to recover,” Pam says. Download the Finding Rover lost dog app that uses facial recognition. Upload a photo of your dog’s face to the site now, just in case. If someone finds a dog, they can upload a photo to help find a match. Attach a GPS pet tracker to your dog’s collar. Some even give an alert when your dog leaves a pre-determined area. 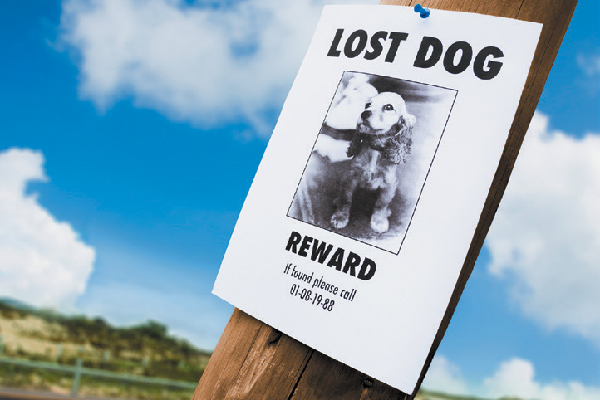 The free ASPCA Pet Safety App has resources that include a personalized lost pet recovery kit and tools to make printed and digital posters. To expand social media coverage, see if your local city has its own website or Facebook page. Call all local shelters and veterinarian offices. If your dog is picked up by a Good Samaritan, that person might take your dog to a shelter close to their home, which could be miles away. Extend your search a few cities beyond your closest shelter; call and visit daily. If your dog has a doggie friend, take her on your searches. Have the dog bark to catch your dog’s attention, Pam says. If all else fails, hire a trainer with a tracking dog, who might be able to follow your dog’s scent trail,” Pam recommends. Being vigilant and taking protective measures keeps your dog at home where he belongs. And there’s no escaping the benefits of that kind of peace of mind. ASTON—After escaping from his home and being gone for five days, Aston the Greyhound was recovered thanks to an unlikely combination — flyers, technology, pee and song. Aston escaped from his California home. He was a rescue from the Greyhound Adoption Center (GAC), which helped rescue him again. When Aston’s escape was posted on the GAC’s Facebook page, up to 40 people volunteered each day searching for him and distributing flyers. “Technology was the key to finding him in time,” says GAC founder Darren Rigg. “We kept updating the Aston sightings on our Facebook page and kept in touch with the volunteers via cell phone. Other animal rescue groups shared our Facebook posts.” GAC kennel manager Denine Hunt parked a van at one of those sightings and placed a crate nearby. Volunteers sprayed the area with dog urine collected at the kennel, hoping Aston would recognize the smell. He did and, thanks to Denine singing a song Aston was very familiar with during his year at GAC, Aston trotted up to her and was soon on his way home. A fence that is easy for dogs to exit is also easy for thieves to enter. A see-through fence particularly lets everyone know you’ve got a dog in the yard that isn’t being watched. Dogs do get stolen. Overly curious children may try to pet your dog from the other side. This is especially risky if your dog is territorial or isn’t keen on new people. See-through fences are problematic, as children can reach in. Foxes and coyotes are obvious predators, but even large hawks can and do lift small dogs. If your dog is prone to barking, your neighbors may complain about a noise nuisance. You can be fined for this in many areas. It can be a health risk for the dog. In some areas it is even illegal to leave a dog outside in extreme heat or cold. Dogs confined to the yard are not being socialized and are at high risk for developing problem behaviors. Thumbnail: Photography ©Chalabala | Getty Images. The post How to Prevent Dog Escapes — and Find a Lost Dog If He Does Get Out appeared first on Dogster.